Fluff!! Soft, "marshmallowy" white. Looking for a white with a recognizable, unique style? Look no further. Some whites look plain and uninteresting. Fluff has a bold beauty and encompasses an aesthetic all its own. Fluff chalk mineral paint is an impressive way to add clean, crisp white to your home! Did you know that Dixie Belle Paint can be mixed together to come up with beautiful new colors?!? You should experiment and see what you come up with. 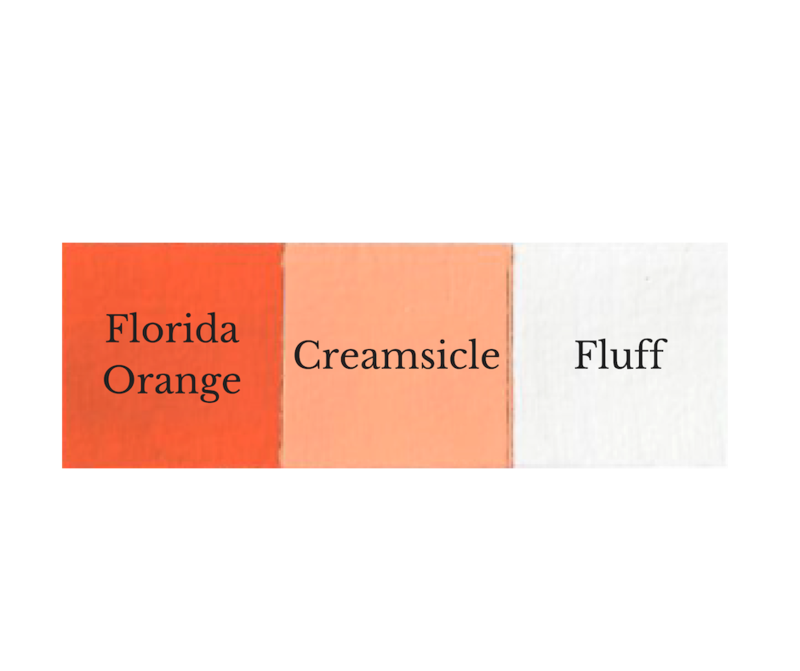 Here is one color we came up with by mixing Fluff with Florida Orange, we like to call it "Creamsicle". We would love to see what you come up with by mixing Dixie Belle Paint Colors. Come on, give it a try, we double dog dare you! I painted an old door cabinet with the Fluff and stenciled Pallet Party's Farmhouse on the old door. I finished up with Dixie Belle No Pain Gell Stain-Walnut on top. It turned out so cute. Love this piece!! First paint I tried by Dixie Belle and it's awesome paint. Very easy to use, no smell. I used it mostly to paint 11 camper fabric cornice valances. It works on fabric. For the first coat I mixed with 2 parts water and 1 part color free fabric softener to sort of work in and dye the fabric. Second coat I mixed with part water. Third and final coat I used pure paint but dipped brush in a tiny bit of water to spread the coverage. I need 4 coats only because it was a tight fabric and dark and I was going white. Turned out great. 2 coats of their matte finish top coat. I also painted a wooden board. Have tried several chalk type paint brands and this is up there with the best. Can't wait to try more colors on more projects. I love Dixie Belle Paint it has changed my business and made my job so much easier!!! Love it. Great color if you are looking for a nice crisp white. White paint, no matter what type it is, usually has coverage issues. We've found DB Fluff to have amazingly good coverage, even on dark wood pieces. It's also a clean, bright white without yellow undertones. Love it! Thanks, Dixie Belle! As a business owner, I am always looking to provide our customers with the very best products. We have trialed several paint brands to have repeated quality problems. Dixie Belle has offered us the solution to previous problems. The paint is absolutely amazing! I was impressed with the coverage and small amount needed compared to other brands. 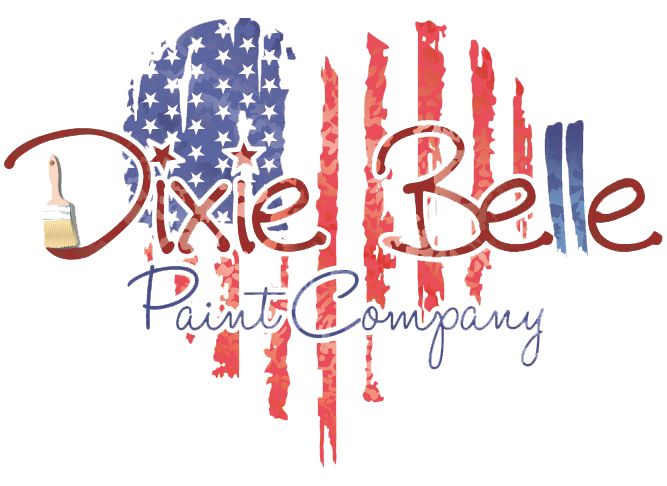 We are so excited to have found Dixie Belle Paints and begin working with them! If you are looking for a miracle paint, you have come to the right place. I received my order and Fluff was the first color I pulled from the box. I chose a coffee table out of my inventory that was 5ft long and dark stained. with the excellent performance with Dixie Belle Paint! I may have found my new favorite paint! best white white there is! A true white great choice for those who want a stand out white! Fluff is a true white that covers amazingly. It's one of my favorite Dixie Belle colors, and that's saying a lot! I've been painting furniture for 25 years, & I've never loved a paint as much as I love Dixie Belle!